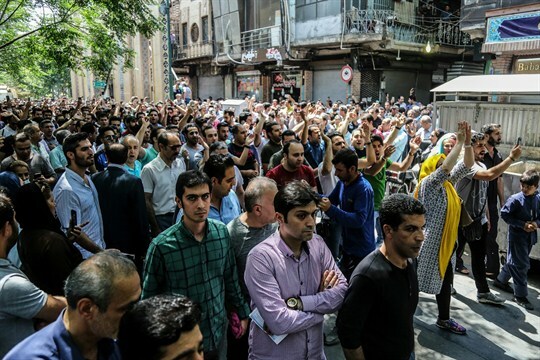 A group of protesters outside the Grand Bazaar in Tehran, Iran, June 25, 2018 (ILNA photo via AP Images). A few years after Iran’s 1979 revolution, Ayatollah Ruhollah Khomeini disregarded an aide who was worried about inflation by declaring that “this revolution was not about the price of watermelons.” His successors may not have the luxury of assuming that the Islamic Republic’s religious essence is more important to most Iranians than their economic situation. Indeed, the proverbial price of watermelons has now plunged Iran into a potentially explosive economic crisis, with waves of public protests. The situation has been exacerbated by U.S. President Donald Trump’s decision in May to violate the terms of the nuclear deal with Iran and reimpose sanctions.